Is Urban Meyer still having fun coaching Ohio State? 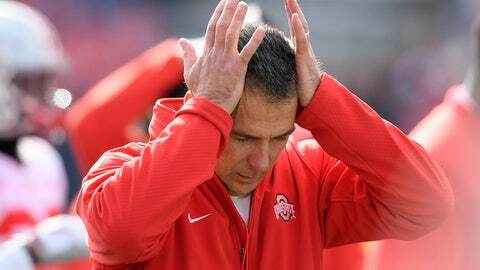 COLUMBUS, Ohio (AP) — Urban Meyer doesn’t seem to be having much fun these days. The Ohio State coach is not demonstrably mirthful, of course, at least not when it comes to his job. But the 54-year-old Meyer’s sideline demeanor has taken on a decidedly beleaguered stoop this season. The usual shouting and gesticulating, the ripping off of his headset, those are often followed by a hand moving up to the left side of his head because of severe headaches. Just last week, TV cameras captured his pained reactions as his team slogged through a mistake-filled overtime victory over Maryland, adding to the speculation that health problems could lead to his early retirement — something he has repeatedly denied. On the eve of the biggest game of the year, No. 10 Ohio State’s showdown with No. 4 Michigan this weekend, it is easy enough to wonder if Meyer is still suffering through one of the more difficult stretches of his storied career. This season, his seventh in Columbus, was tumultuous bordering on absurd even before the first game kicked off on Sept. 1. Meyer weathered a scandal involving a now-fired assistant coach that led to his suspension for the first three games and a series of public apologies and explanations. He has had a flareup of the arachnoid cyst in his head that causes debilitating headaches, one of which dropped him to a knee during a game on Oct. 6. He lost star defensive end Nick Bosa to an early season-ending injury, and the Buckeyes‘ defense never fully recovered. The problems led to a shocking blowout by unranked Purdue on Oct. 20 that pushed Ohio State to the fringe of the playoff picture. Other injuries have been a plague all year. Just last week, Meyer had to stop preparations for the Maryland game and address another off-the-field issue, this one involving a report that a former player left the program because of bad treatment. Everyone at the university issued denials, but Meyer had to talk to the team and the media about it while trying to keep it from becoming a distraction. It is safe to say that nothing has personally hurt Meyer more in his career than people saying his lax treatment of now-fired assistant coach Zach Smith made him culpable in the domestic abuse allegedly suffered by Smith’s ex-wife. Meyer said he knew about the accusations against Zach Smith — grandson of former Ohio State coach Earle Bruce — but wasn’t sure they were true and kept Smith on his staff because no criminal charges were filed. The university cited that lapse when it suspended Meyer . “(I) think he would be ok if I said his ‘control/perfection’ issues are the most difficult to deal with — as we know LOGICALLY, a person can’t control everything, and being perfect is REALLY hard when (you) can’t control ALL,” she wrote. Meyer won two of his three national championships at Florida but retired twice because of stress-related poor health, leading to chatter recently that he might be close again to doing something else. He already has experience as an ESPN broadcaster. He’s a grandfather now, and he and Shelley are empty-nesters. He will make $7.6 million this year, with a contract that runs through 2022. There have been reports that the 39-year-old Day — who moved from the press box to the sideline with Meyer this season — is being groomed as the coach-in-waiting, although Ohio State has denied it. Meyer, who acknowledged depression and anxiety issues late in his six-year tenure at Florida, said he is not close to giving it all up. He told reporters recently he plans to be Ohio State’s coach for “as long as I can,” without saying exactly what that means. As long as his health will allow it? Until he starts losing? Until he’s no longer having fun? Winning, of course, makes everything better. Meyer has done a lot of it and is paid handsomely. He is 80-9 at Ohio State. He has beaten Michigan every year he’s been here and few would be all that surprised if the Buckeyes manage to do it again Saturday at Ohio Stadium. Meyer also insists he’s fine and is enjoying himself — as long as the Buckeyes win.